Time and again, history has demonstrated that extreme levels of inequality can undermine a civilization’s ability to thrive—even shattering society itself. Today, the United States faces extreme levels of inequality that pose clear threats to its society and economy. Yet, alternatives to violent upheaval exist. A far more sustainable and equitable society is not only possible—it presents enormous opportunity. Present day civilization has the tools to create its own five centuries of prosperity. ‘It will never work’ is not an excuse. 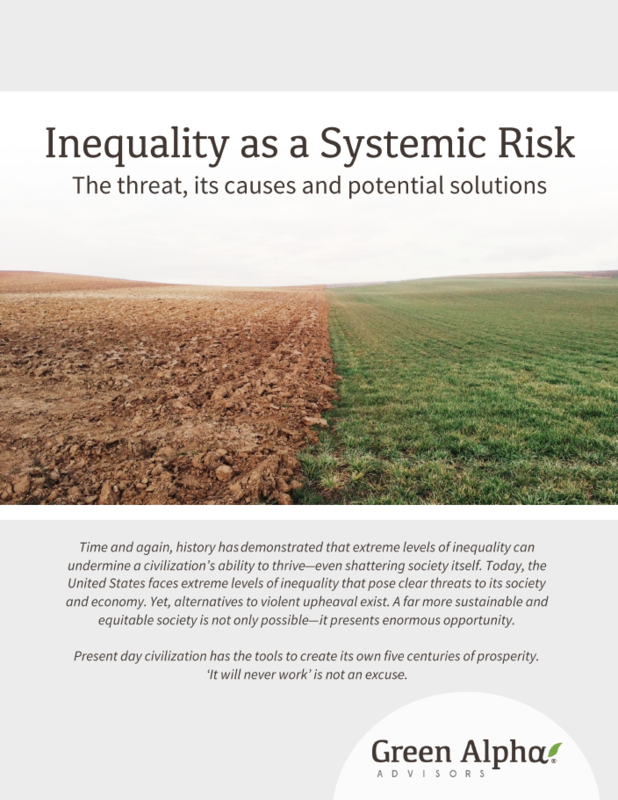 Societies of the past illustrate risks posed by extreme inequality. Civilizations across history demonstrate that wealth and income inequalities can and do rise to the level of ‘dangerous risk,’ most often manifesting in the form of eroding social cohesion and even civil strife. Inequality in the U.S. is reaching an extreme. As both the richest and one of the most unequal countries in the world, the United States may be particularly fertile ground for the destructive outcomes of this rising risk. According to Pew Research Center, U.S. income inequality has been increasing steadily since the 1970s, and now has reached levels not seen since 1928. Solutions to inequality present opportunities economy-wide. Some possible means of mitigating inequality: prepare people for jobs that add value in a digital age, create human-empowering tech and distribute ownership, invest in a diverse workforce and leadership, and develop protective and equitable policies.